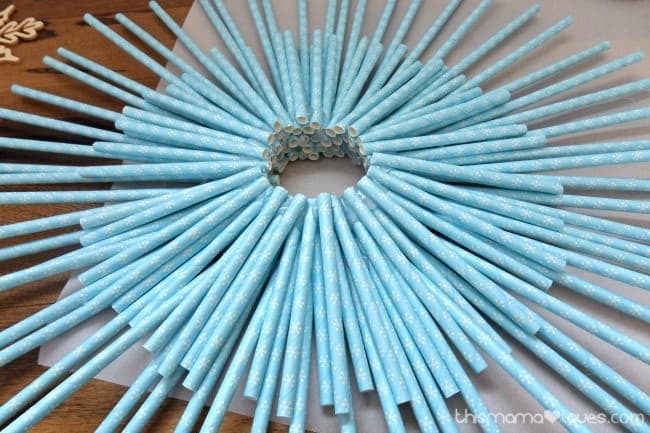 I just love all of the paper straws I see in the party supplies or in the baking aisle. They come in so many patterns and colors. 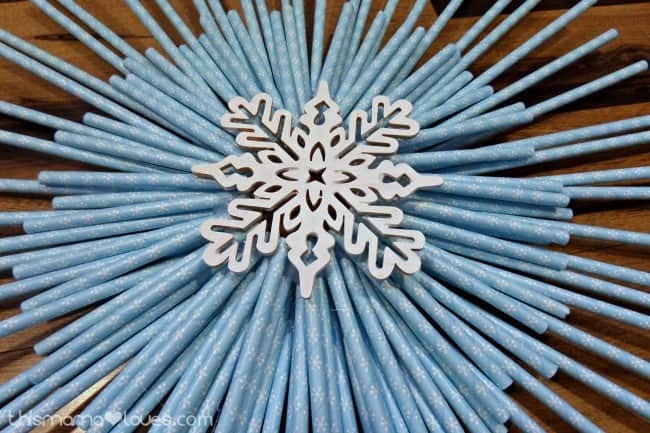 I recently found these blue paper straws with snowflakes at the dollar store and thought they would make a fun craft. The last few days have been so, so very cold and we’ve been staying inside and doing crafts since it’s too frigid to be outside playing. 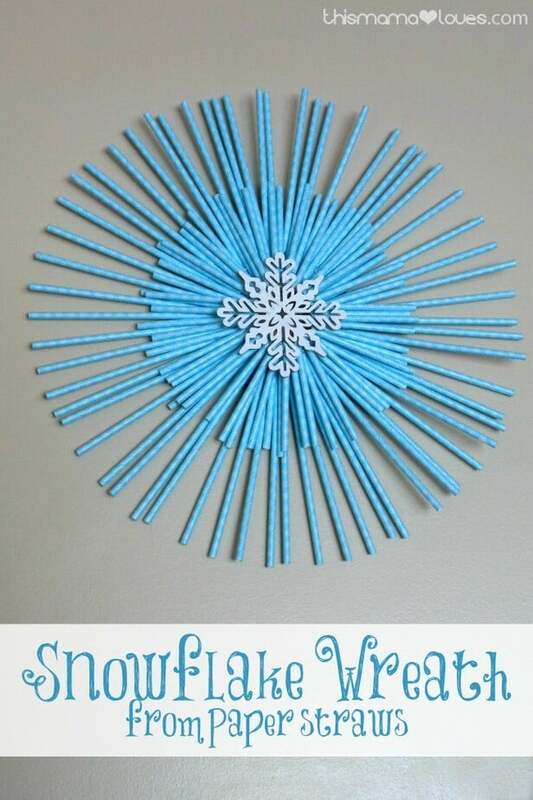 Today we made a Snowflake Wreath from those adorable paper straws. This project took about an hour and cost less than $10 to make! 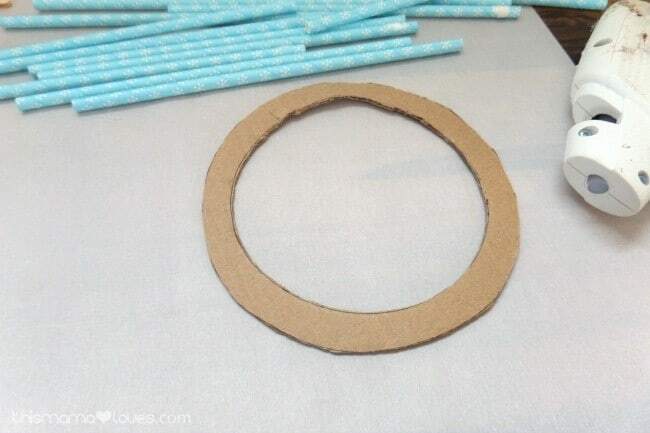 Begin by cutting a circle from a piece of cardboard. You could use other things for the wreath form but I found that the hot glue secured the paper straws to the cardboard better than to other items. I first tried a ring for a mason jar and the straws did not want to stay attached. 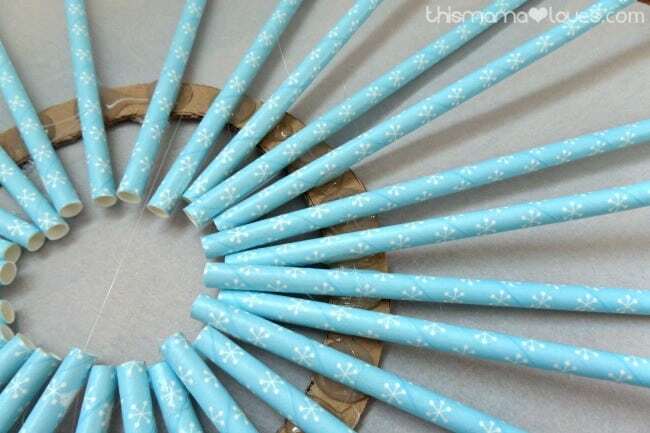 Begin attaching the straws to the cardboard ring with the hot glue. I attached straws opposite each other first to try to keep them somewhat in line, then added the straws in between. Do not crowd them but keep them close together. I let the straws overlap the card board on the inside by about 1 1/2″. You’ll probably have lots of strings of hot glue but those can easily be removed when the wreath is finished. Continue gluing the straw on, now overlapping them. 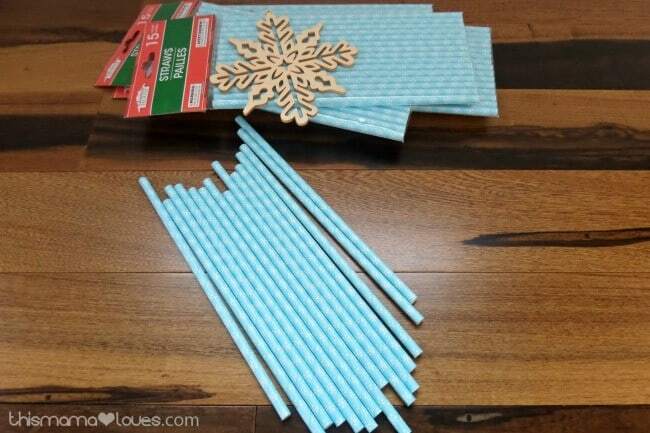 After you’ve made the wreath quite full with whole straws, cut several in half and add those. This gives the wreath more depth and dimension. Paint the wooden snowflake ornament with white paint and let it dry completely. Once dry, attach it to the center of the straw wreath with hot glue. The cardboard ring that the wreath is mounted to easily slips over a trim nail or wreath hook. Hang and enjoy all winter long! I know after taking my holiday decorations down I needed something new and fun to brighten things up! I love this idea! Thank you for sharing! I think I will try to make it with old newspaper, paint them in blue like this, because the convenient store near my house only have plastic straws. 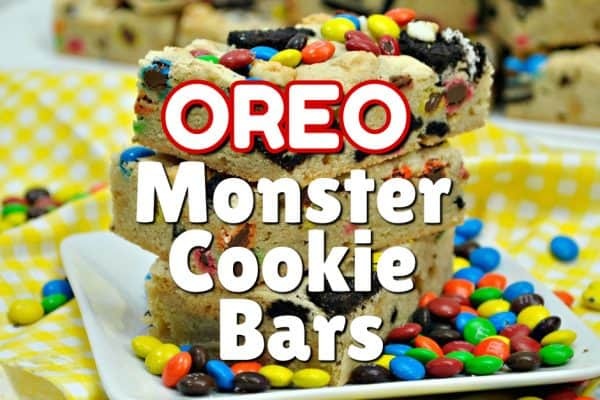 I think this is so inventive! 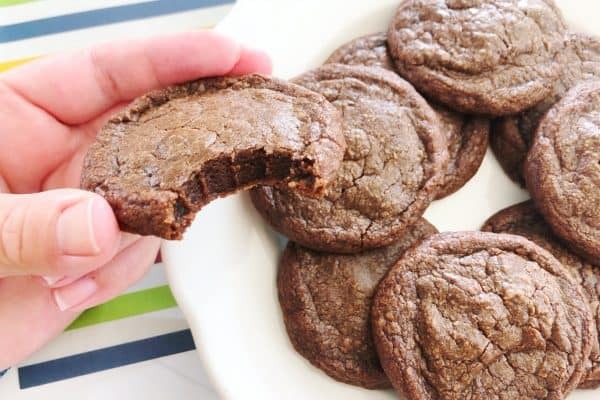 I featured you on the Wonderful Wednesday blog hop this week. This idea is just too creative not to share. This is a neat idea and so pretty! I have never bought paper straws before, I will have to look for some. Tats pretty and I bet right after holidays those straws will go on sale. 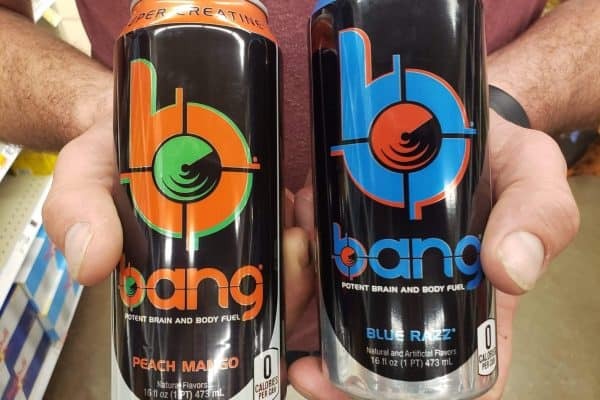 You know what ths puts me in mind of are those starburst clocks that were popular way back in the day= maybe the 70s or so? I cant post a pic of one, but it kinda looks like this craft- very nifty!